With a global economic situation that does not seem too pessimistic for 2012, demand for mobile computing will rise steadily and the price-performance ratio of tablet devices will improve. And there will be improvements to the software and hardware support for Android-based tablets. These factors all contribute to a 60% growth in tablet shipments to 95.10 million units in 2012. This Digitimes Research Special Report analyzes the market and forecasts the prospects for 13 major tablet brands worldwide for 2012. In the fourth quarter of 2011, worldwide sales of branded tablet devices saw zero growth amid a global economic downturn. Many started wondering whether the tablet market was already maturing. 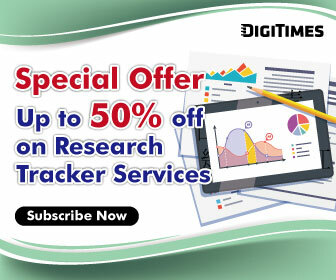 However, Digitimes Research's analysis shows that the fourth-quarter zero growth was a special case resulting from the double impacts of the March 11 disasters in Japan and the weak economy. They are not expected to hinder the future of tablet devices. The global economic situation does not seem too pessimistic in 2012. 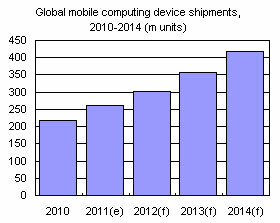 Demand for mobile computing will rise steadily and the price-performance ratio of tablet devices will improve. And there will be improvements to the software and hardware support for Android-based tablets. These factors all contribute to a 60% growth in tablet shipments to 95.10 million units in 2012. Digitimes Research defines shipments as devices shipped from ODM/OEM partners to brand partners. Brand vendors' shipments to channels are not taken into consideration. After a year of trials and tribulations in 2011, capable vendors have already established firm places in the global tablet device market. Digitimes Research has examined 13 major tablet brands worldwide, predicted their shipments in 2012, and assessed the importance of tablet devices in these vendors' overall product lines. Inside the Top-3 camp, the king - Apple - has shown its bottleneck. Its strategy of one model per year undermined its sales momentum in the fourth quarter of 2011, while competitor Amazon enjoyed brisk sales during the hot season. Samsung Electronics was in a neck-and-neck race with Apple in both smartphone and notebook sales. Samsung's next target is the tablet market, and its shipments stand a chance of hitting 10 million units. Within the camp comprising Apple's competitors, Samsung, PC and e-book vendors will form three major forces in the tablet market. Major PC vendors in the tablet market include Lenovo, Acer and Asustek Computer, with each of them shipping 2.5-3 million tablet devices, or almost 10% of their overall shipments. Handset vendors' tablet shipments are mostly be less than 2 million units each, sharing less than 5% of their overall shipments. Among e-book reader vendors, Amazon still leads Barnes & Noble by a wide margin, but their proportion of tablets will both still be at least 30% of their overall shipments.